PowerCenter Metadata Manager is a metadata management tool that you can use to browse and analyze metadata from disparate metadata repositories. Metadata Manager helps you understand and manage how information and processes are derived, the fundamental relationships between them, and how they are used. Metadata Manager uses PowerCenter - Data Analyzer functionality. You can use the embedded Data Analyzer features to design, develop, and deploy metadata reports and dashboards. 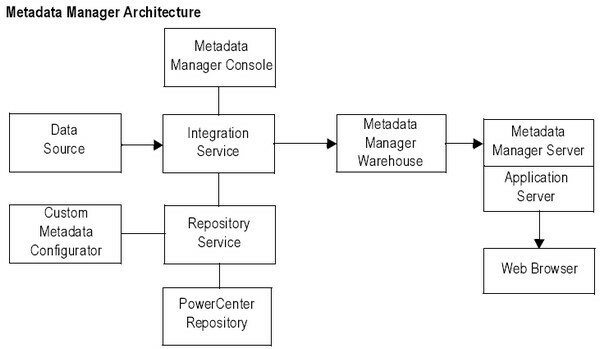 Metadata Manager uses PowerCenter - Workflows to extract metadata from source repositories and load it into a centralized metadata warehouse called the Metadata Manager Warehouse. Metadata Manager Console. Set up, configure, and run XConnects, which load source repository metadata into the Metadata Manager Warehouse. Each XConnect consists of a preliminary transformation process and PowerCenter workflows that load metadata from a particular source repository into the Metadata Manager Warehouse. You can also use the Metadata Manager Console to set up connections to source repositories and other Metadata Manager components. Metadata Manager Custom Metadata Configurator. Create XConnects to load metadata from source repositories for which Metadata Manager does not package XConnects. Metadata Manager Interface. Browse source repository metadata and run reports to analyze the metadata. Also, use it to configure metamodels, set up source repositories, configure the reporting schema, and set up access and privileges for users and groups. application server. Helps the Metadata Manager Server manage its processes efficiently. The Java application server provides services such as database access and server load balancing for the Metadata Manager Server. The Java application server also provides an environment that uses Java technology to manage application, network, and system resources. Metadata Manager Server. Manages the source repository metadata stored in the Metadata Manager Warehouse. You can use Metadata Manager, which uses the Metadata Manager Server, to search, view, and configure source repository metadata and run reports. Metadata Manager Warehouse. Stores the Metadata Manager metadata, such as the Metadata Manager reporting schema, user profiles, and reports. It also stores source repository metadata and metamodels. PowerCenter - Repository. Stores the workflows, which are XConnect components that extract source metadata and load it into the Metadata Manager Warehouse. Web server. Fetches and transmits Metadata Manager pages to web browsers. Each supported application server contains an integrated web server.